A handy guide to the bugs found in Super Mario Bros. uses animation for better understanding. TASVideos, a website dedicated to tool-assisted videogame movies, has compiled a neat Super Mario Bros. glitch page that provides graphical examples of the game's bugs that could potentially be used in a speedrun. The tricks might be nearly impossible to perform in real-time play, but it's interesting to see some of the inner workings of Nintendo's classic game. 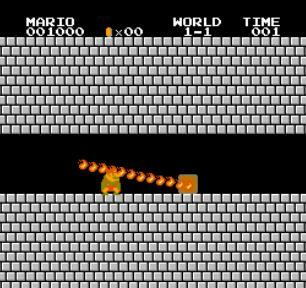 Did you know that Mario has the ability to perform a walljump? Sure, he officially started with the technique in Mario 64, but he could do it back in the days of the NES too. The glitch page shows Mario's walljump in action, and explains that it works through a floor check when Mario jumps into a wall with his feet precisely at a block boundary. If you somehow muster the ability to do one while playing Super Mario Bros., now you know why it happened. The page also shows off a couple of flagpole glitches, teleportation bugs, and Mario's ability to phase through walls: fairly standard stuff. The coolest ones available so far though are Mario's "moustache stomp," one-foot slide, and firebar avoidance. Evidently, Mario only has to be moving downward to stomp on enemies, so if he contacts an enemy at the edge of a ledge while falling downard, he'll stomp it wth his face and hop onto the ledge without dying. The one-foot slide puts wheelies on Mario's shoes when he first enters a level or exits a pipe, so he'll slide along on one foot instead of running. It might seem like those firebars will swipe you no matter what, but their frames are only rendered at certain spots, so Mario can actually duck and squeeze between frames even when close enough to be killed. It's all there, so go take a look. The page is still under construction, with dozens more GIFs and glitches planned to be added in the future.